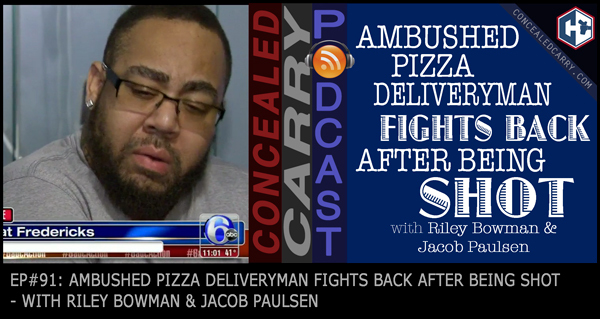 Riley and Jacob cover some important stories about proposed laws being debated in various states plus highlight an extremely compelling JUSTIFIED story where one man is shot and is forced to fight back for his life and his 8 kids! Also we are getting ready to celebrate our 1-year anniversary since launching the podcast, and we are giving away a bunch of great prizes! Listen in for how to enter the giveaway!! Today’s episode is brought to you by Sports Afield Gun Safes. The lowest prices ever now being offered on ConcealedCarry.com; Sports Afield has been taking care of the American sportsman for over 100 years. Their line of handgun and full size safes balances incredible quality and economic prices. With the best warranty in the business, you can trust Sports Afield with your tools of self-defense. In fact right now both the single and double handgun pistol safes are on sale so go to concealedcarry.com/shop and check them out. I tried to take your survey, but the link that you provided on air and on your web site does not work. It gives a page not found error. I’m sorry it did not work for you. It could have been a temporary network error. We just tested it multiple times, and it appears to be working again. Thanks for tgevrrply, but, I tried again. Same error. 404 page not found. That’s using the link in your show notes and the one I copied to my original message. Can you email me at [email protected] ? I’ll send you a different link that should hopefully work, but I don’t want to post it publicly. Leave a Reply to Stanley Orlowski Click here to cancel reply.